If you’re a gigging musician or if you want the ability to jam on the piano with others, you need a good portable keyboard or stage piano. Acoustic pianos or console-style digital pianos are great for practicing in your living room, but unless you want to l﻿ug around an instrument﻿﻿﻿ weighing hundreds of pounds, they fall short in portability. Stage pianos offer a great piano experience but also weigh much less, take up less space, and are infinitely more portable. There are several top quality brands that offer an array of wonderful stage pianos. With all the great portable keyboards on the market today, it’s becoming increasingly difficult to settle on the best one for you. In this article, we narrow it down to the five best portable keyboards out there. 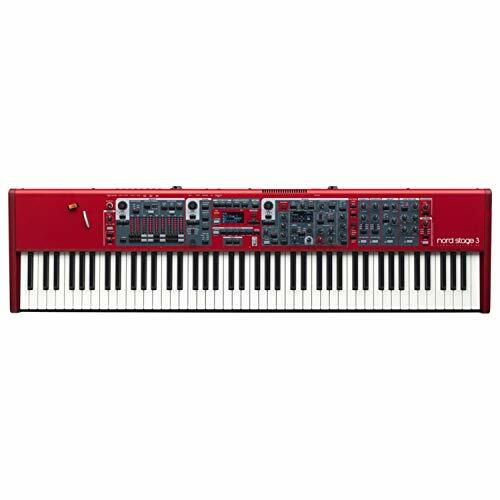 The Nord Stage series pianos have been touted as some of the best stage pianos in the industry, and the Nord Stage 3 88 lives up to the high expectations. It is boldly designed with a bright red exterior and straightforward layout. This 88-key version is equipped with Nord’s Hammer Action keyboard, giving you fully-weighted hammer action. The Stage 3 88 comes with the new Factory Bank that offers an array of realistic and synth sounds. You also have free access to the excellent Nord Sample Library, with a large and constantly updated sample selection. Like its predecessors, this keyboard features Nord’s award-winning organ and synth sounds. The organ sounds incredibly authentic, care of the B3 Tone-Wheel simulation. Using Nord’s Powerful Classic Analog, the synth is a remarkable piece of work, with both FM and Wavetable synthesis. The real-time effects are terrific. The overall sound quality? Excellent. The Nord Stage 3 88 is a great option if you’re looking for something truly versatile. However, expect to be set back a pretty penny for this beautiful instrument. The Korg SV-1 vintage stage piano represents Korg’s foray into vintage-style keyboards, and the results are top notch. The SV-1 has retro styling that looks great on stage, and features 36 expertly-mastered vintage keyboard and piano sounds, so you can muster any sound you might need during a performance. The “retroness” of this digital piano also makes it more usable. It’s control panel is entirely single-function dials, knobs, and buttons – none of the computer screens and endless menus you have to wade through on modern keyboards. That means you can easily get it set how you want during a show, and it’s simple to change on the fly. The SV-1 also features Korg’s RH3 Graded Hammer Action keyboard, so it has the responsiveness and satisfying touch of a real piano. If the Nord Stage 3 is out of your price range, the Korg SV-1 is a worthy substitute that doesn’t sacrifice much. The SV-1 also comes in a 73-key version. Roland pianos are well-loved by musicians who have had the good fortune of playing one. The Roland RD-2000, in particular, borrows technology from Roland’s V-Piano, which is arguably one of the most advanced digital pianos in the industry. The SuperNATURAL Piano engine lends the player unbelievable sound quality and expression. Add that to Roland’s PHA-50 Concert Keyboard with Escapement and Ebony/Ivory feel and you have yourself a winning combination. The Roland doesn’t overwhelm with its streamlined layout. The panel is generally clean and easy to navigate and features a large, backlit LCD display that is easy to read in any lighting. You can also customize your piano sounds through the Piano Designer, and you can store your changes for later use. If you’re looking for the best portable digital piano for live performance that has tons of features and is easy to use, then the Roland RD-200 is probably your best bet. Yamaha is universally known for their brilliant acoustic pianos, but they also make some of the best portable piano keyboards on the market. The Yamaha CP4 exemplifies their piano expertise and provides a sound and feel that is incredibly similar to an acoustic piano. The CP4 features brilliant sound samples from some of Yamaha’s finest grand pianos: the CFX, CFIIIS, and the S6. The keyboard has wooden keys concealed under synthetic ivory, and features Yamaha’s Graded Hammer action technology for an unmatched real piano feel. The CP4 is highly adaptable to any sort of playing style, and it’s great at reproducing the sound of an acoustic piano. However, it does fall a bit short on the synth and strings, offering samples that sound more utilitarian than anything. If you need great synth or other digital sounds, there are better options available. 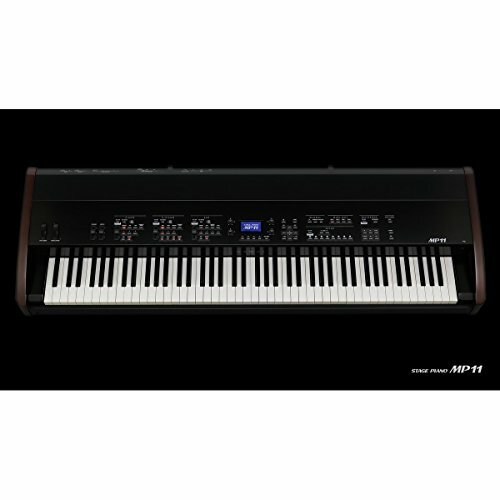 The Kawai MP11 professional stage piano is a beautiful instrument and it provides an unmatched real piano experience. If we were judging these pianos solely on realism and authenticity, then this Kawai would be the winner. The MP11 features a Grand Feel keyboard action that is incredibly sensitive and responsive, due to the tripe sensors under the ivory-touch wooden keys. The sound quality is another high point. The piano sounds were sampled from the Kawai EX concert grand piano, which is one of the finest grand pianos in the industry. However, if synth sounds and other digital bells and whistles are your thing, this isn’t the unit for you. This is also the heaviest digital keyboard on this list, weighing in at 71 lbs. While it is still portable, it might be a little hefty if you’re constantly transporting this to and from gigs. Korg SP280BK 88-Key Digital Piano. Super portable and ultra affordable. Korg makes great keyboards and this one is no different. This is easily the best portable keyboard under $1,000. Kurzweil ARTIS 88-Key Stage Digital Piano. Kurzweils are legendary for their powerful tone and playability. This is one great-performing stage piano. Casio PX560BE 88-Key Digital Stage Piano. Packed with features and a large variety of sounds, all at an affordable price. Nord Piano 3 88-Key Stage Piano. A bit less expensive that the Nord Stage 3, but still a worthy instrument for any stage. 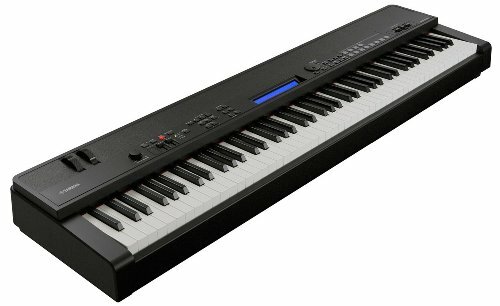 Dexibell VIVO S7 88-Key Digital Stage Piano. A newcomer on the scene, the Dexibell S7 is an awesome gigging keyboard with Roland pedigree. There are many excellent portable and stage pianos out there, and the ones on this list are a great starting point. If you’re looking for more options beyond this list, Korg has some great pianos as well. No matter what you choose, you’ll have a blast taking your piano with you and playing on stage! The unfortunate thing about this review for 2017 of best stage keyboards is that most of them are no longer available. Could future annual reviews try harder to choose keyboards that are actually available for sale? Otherwise, what is the point of the reviews? Thanks for the comment! You are correct, two of these models are no longer available for purchase. At the time we wrote this review, all of these keyboards were available and were the best in class (in our opinion). Unfortunately, manufacturers sometimes discontinue keyboard models, or pull certain models when they come out with an updated version. We’ll be updating this article for 2018. Thanks for reaching out, and let us know if we can help further! I love what you said about the top quality brands of stage pianos. I think mobile stages are so convenient because they can fit into a wide variety of venues. Mobility is crucial when it comes to musical performances. If I were to need a mobile stage, I would make sure to call a reliable event service.